Black and white boards... driving colors!! This is undoubtedly one of our simplest carrier boards, but like making fire, making colors is something primitively inherent to our genetics. The spirit of art... or the art for the spirit... anyway, this is completely off-topic. 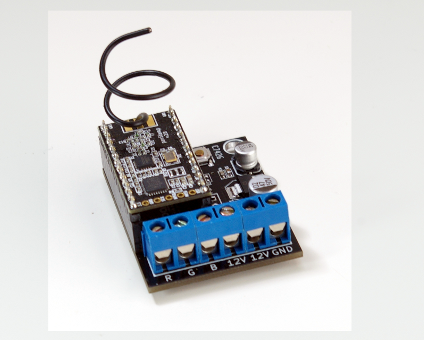 RGB driver board hooks to a common-anode RGB LED strip providing up to 16777215 different control levels, 255 steps per channel (red, green and blue). This board is perfect for creating ambiances and decorating spaces. A single RGB driver board is capable to drive a complete 5-m reel containing up to 30 RGB LED's (1A per color channel). This board is automatically detected by Lagarto so we can create our own color sequences from there using a custom Pŷthon script or simply write our macros in the panStamp itself.